It's hard to believe that I am afraid of a white folding piece of aluminum, especially when there's a little rubber ball on the end of it or maybe a tennis ball. Yet the cane scares me and it should scare you, but not for the reasons you think. I was walking with a friend of mine one warm summer day along the crowded streets of Boston. She held my elbow as we were bumped and jostled by the business people racing to lunch and back. After a minute of excuse me's and dirty looks, she stopped and unfolded her cane. "I don't really need it right now," she said, "but it clears the streets." So it did. The stream of people parted and we walked hassle free. The cane, it turns out, has an unmatched power to divide. Walk with me for a moment and I'll explain. See, we want treatments for Usher syndrome. To develop treatments we need lots of researchers doing lots of work. That costs lots of money. The best large funding source out there is the National Institute of Health. The NIH is a governmental agency that, while it is independent of Congress, certainly heads the wishes of the Congress. If enough members of Congress tell NIH to fund a certain project, NIH will fund that project. So for us to get substantial funding for Usher syndrome research from NIH to pay for lots of researchers to do lots of research, we need members of Congress to tell NIH to fund Usher syndrome research. Members of Congress work for you. You elect them and they act on your behalf. The reason they have not asked NIH for more funding for Usher syndrome research is because we have not done a good enough job of letting them know that we want them to do that. We need everyone with Usher syndrome to work together to encourage Congress to push NIH for Usher syndrome research funding. Recognizing that fact, we have been working to build an Usher syndrome community. We want to identify everyone with Usher syndrome, educate them on what it will take to find treatments, then enlist their help lobbying Congress for increased NIH funding (among other things). As part of that effort we have developed a Family Network to connect families and have been running annual Family Conferences to further build that Usher syndrome community we so desperately need. Parents of young children fear the cane. Adults who's vision is still good fear the cane. It's not the painted aluminum they fear, obviously, but what it represents. To them it is a frightening future of limitations and loneliness. They don't want to see anyone using a cane because they might glimpse the difficulties ahead. They don't want to meet anyone using a cane because they might learn how this person was once happy and free and then, when the cane arrived, they turned miserable and downtrodden. The cane, to families not using the cane, is the very symbol of the fear they try so hard to control so they avoid it. They don't want to know the truth about it because the truth might be even worse than they fear. People who use a cane know that. They feared the cane themselves. They fought against it and dreaded the time when they would need it. They know that people look at them with their cane and make assumptions about them. They also know that the cane rather than closing doors, often opens them. The cane is a source of mobility and comfort. The cane parts crowds and allays fears. Oh sure, everyone using a cane would rather not have to use one, but given the alternative, it's a big help. But they understand why people might fear the cane. So they avoid people who don't use the cane because they either don't want to upset them or they don't want to try to explain its benefits to someone near panic. As I said, the cane has an unmatched power to divide. We see this all the time with the family network. Families of young children don't want to be contacted by adults with Usher, adults who might use a cane. Adults who don't use the cane don't want to be contacted by adults who do. 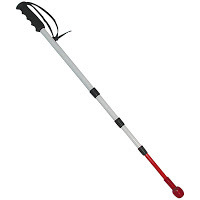 Adults who do use the cane don't want to get involved, don't want to invite tough questions, and don't want to be treated with gentle fear just because they carry a piece of folding aluminum. Now none of these folks openly say that they don't want to be contacted. They just don't join the network or they do join but don't contact people on the other side of that thin white line. We see this all the time at family conferences, too. In the morning you'll find groups of people who use a cane and groups of people who don't. "I shouldn't be here," a friend who uses a cane said to me at the last family conference, "I'm scaring people." "I shouldn't be here," a friend who has Usher but does not use a cane said to me at the last family conference, "I keep staring at the people with canes and I think I'm embarrassing them. I can't help wondering if that will be me." Of course, you know where this story goes. My two friends eventually met each other. Cane and No Cane. No Cane had just recently had to give up driving. Cane understood. He remembered how hard it was for him at first. No Cane met Cane's wife, learned he had two happy, successful grown children. She felt better about her future. Cane offered advice to No Cane. He felt better about attending. For once, having Usher was a good thing. He wasn't scaring people. He was helping people. Cane and No Cane frequently trade e-mails and advice now. They are part of the same community. That's exactly what we need. Look, I understand the emotions involved. I fear the cane, too. I don't want my daughter to ever have to rely on one. I want to find treatments that make the cane unnecessary. But more than that, I fear the cane's power to divide. Usher syndrome research is woefully underfunded because we are not a strong community and therefore not a strong lobby. And it's our fears that are the biggest obstacle to changing that.